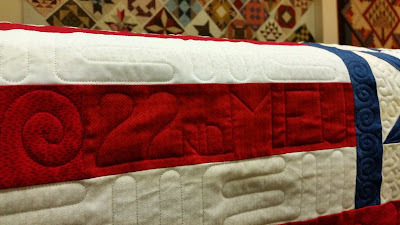 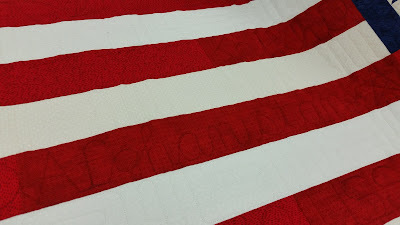 I enjoy the privilege to quilt other people's ("OP") quilt tops a lot as part of my job...it's wonderful! 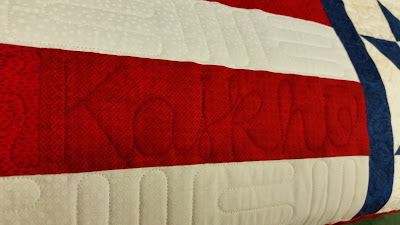 All of them are special, but sometimes I feel particularly honored to work on a special project for someone. 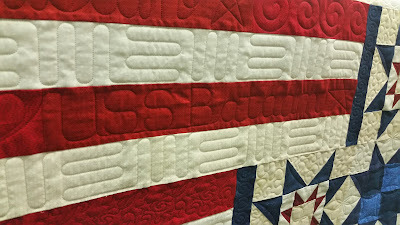 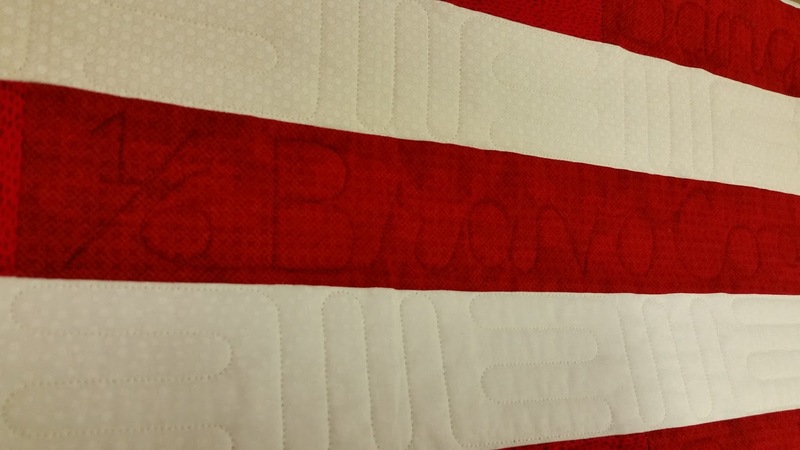 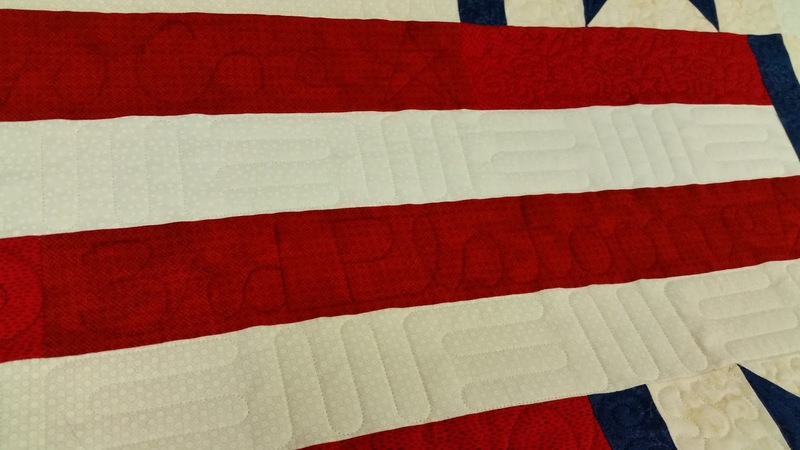 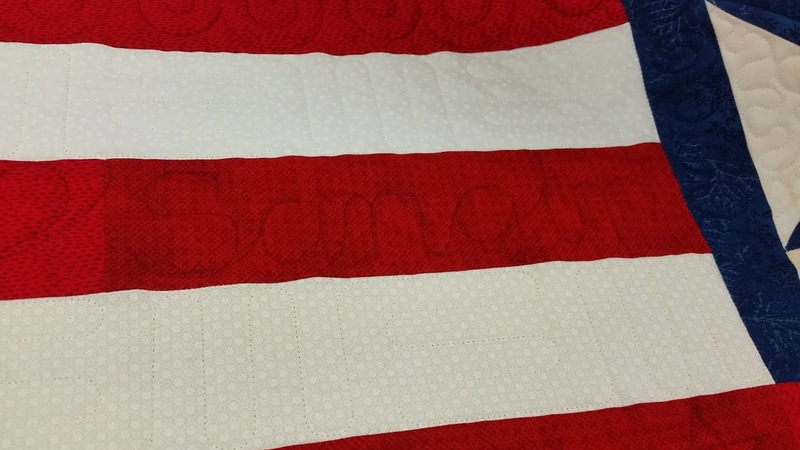 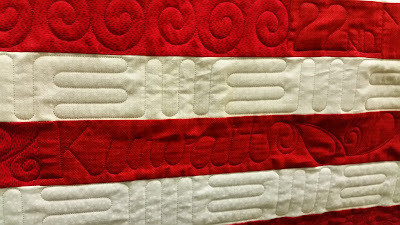 This lovely patriotic quilt was made by a grandmother for her grandson who has given the last few years of his life serving us in the United States Marine Corp. I won't show his name here as I don't know him personally, but what I thought was so very special about this quilt is that Grandmother wanted me to quilt in the names of his duty stations while he was a Marine. 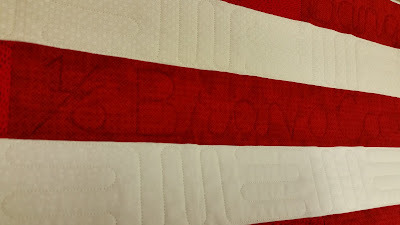 ...Far away lands where he was deployed, and risked his life to protect and preserve our nation. 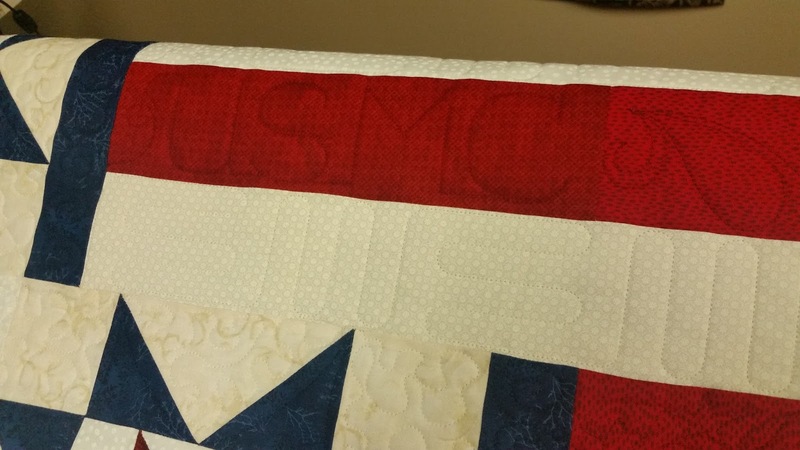 It was an honor and a privilege...Thank You for your Service and Sacrifice Marine! 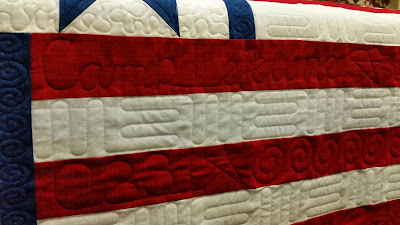 Tomorrow is Veteran's Day. 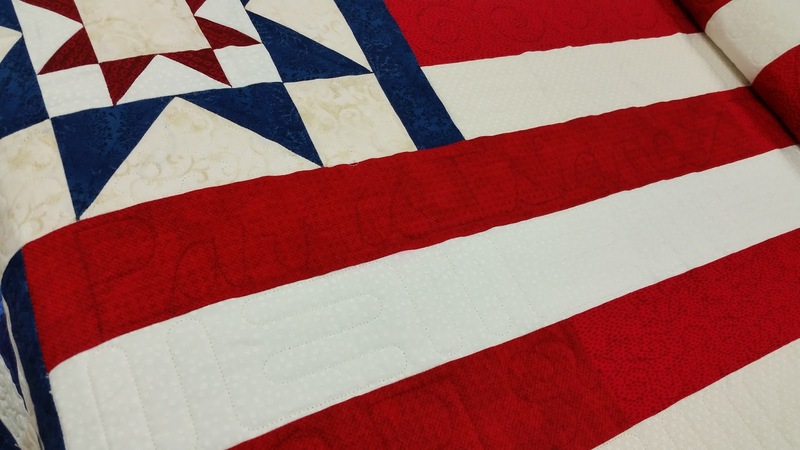 Join us at the shop for our Free Veteran's Day Quilts of Valor Sew-In! 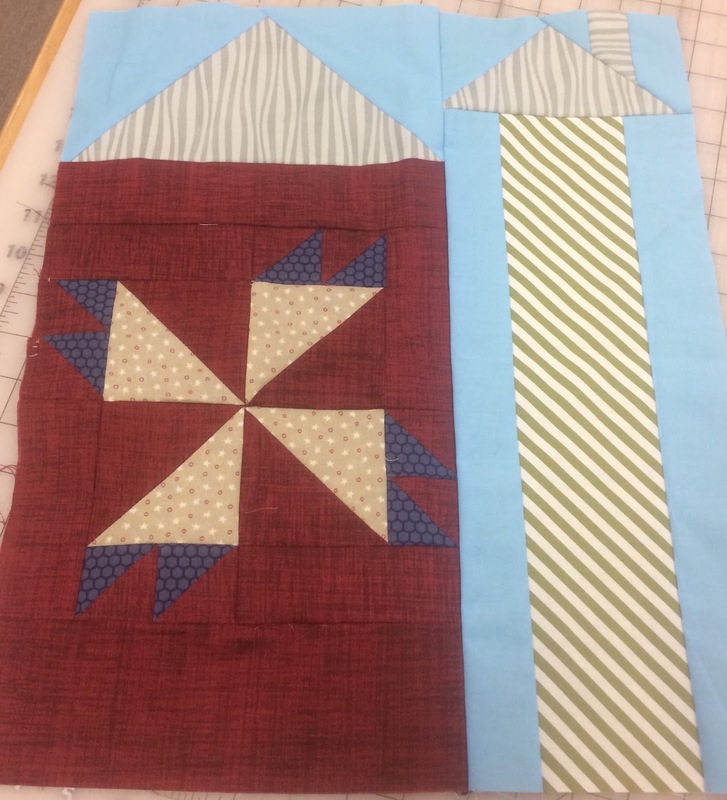 Come for the whole day, or stop by on your lunch break to help us sew together blocks to be put into quilts for Quilts of Valor. 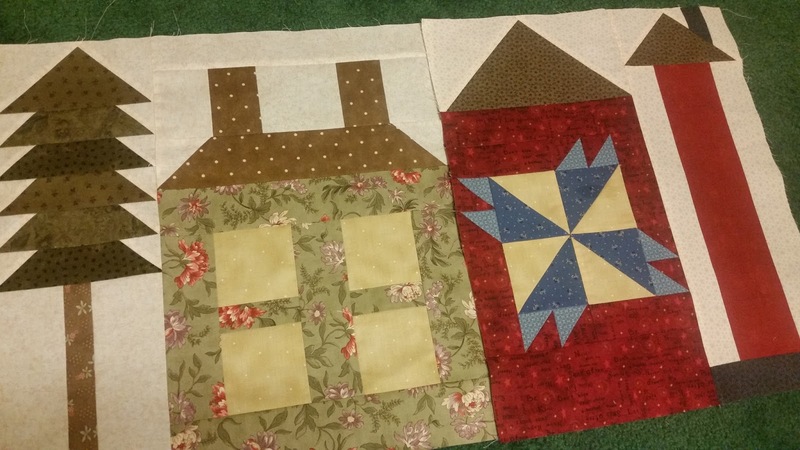 Are you taking Part in the Bonnie Hunter Mystery Quilt This Year? 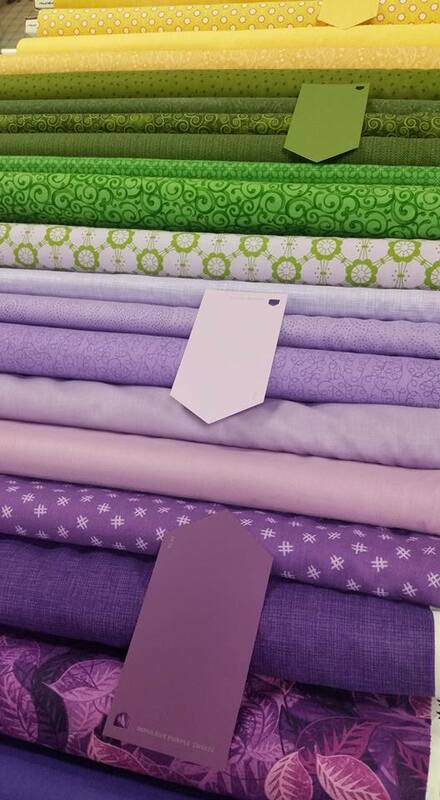 Bonnie has given the color clues out ahead of time, using paint chips as reference to what she is referring to, so you can go through your stash and start gathering up your fabrics. 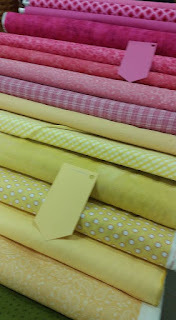 It's meant to be scrappy ~ the more fabrics the better! You can visit Bonnie's blog post to get full description of the colors and how this all works...and then check back there on Friday, November 25th for Clue #1! 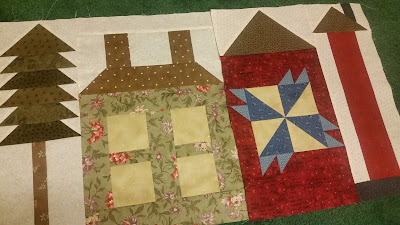 I'm in the process of collecting the grouping for my quilt now too. 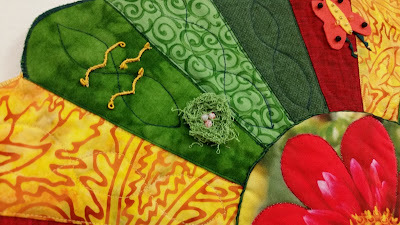 I'll work on the Mystery as an ongoing side project (The real mystery is when I'll ever get it finished), but it's always fun to play along! 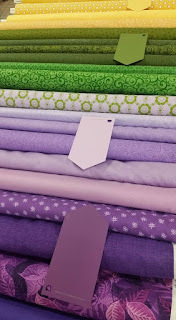 I won't put any pressure on myself to keep up with all the clues, but I'll touch base with all of them along the way, and download them each month, so I have them for when I can work on it throughout the year as my "Leader & Ender" project for a while. You can get all the patterns available on Our Free Patterns Page at our website (currently blocks 1 thru 7 are up, and more blocks will be released one each week for a total of 16 blocks). 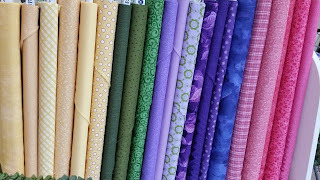 I'm picking out my fabrics for blocks 3 and 4 today. 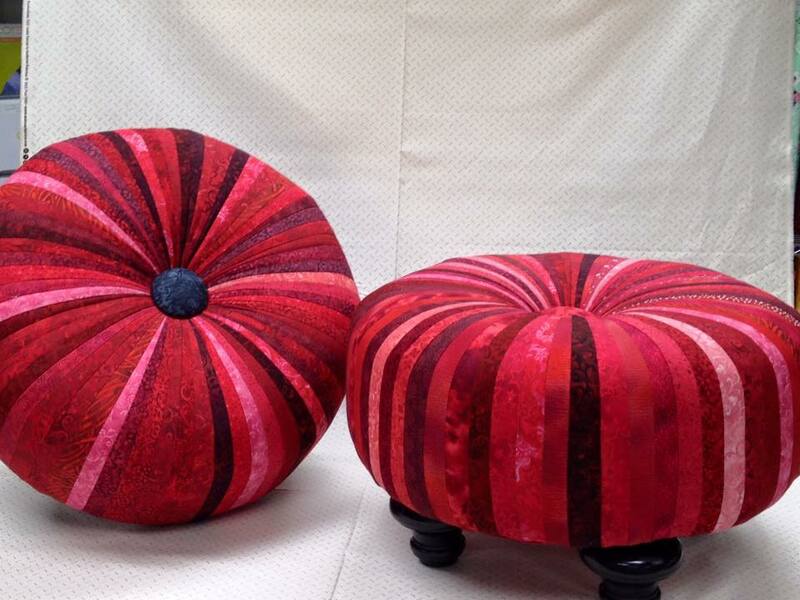 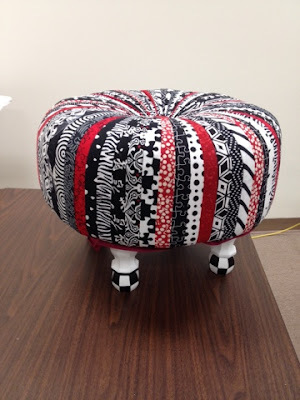 These Red Tuffets were made by Mary and Carrie. 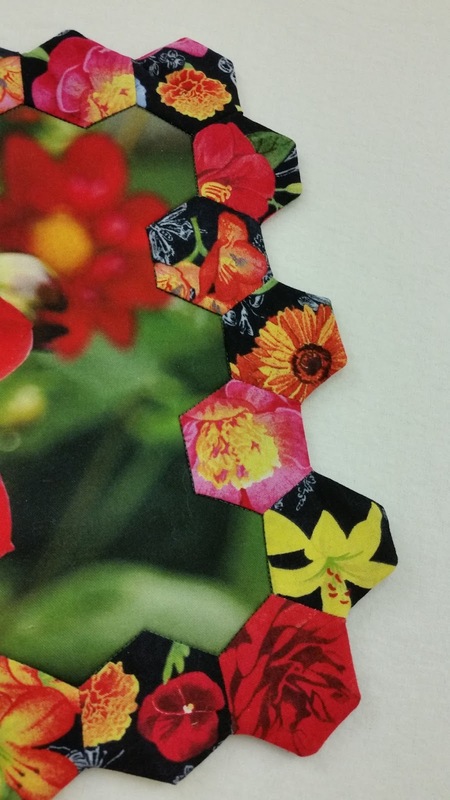 They were made with Essential Gems strip packs, but any strips or scraps can be used. 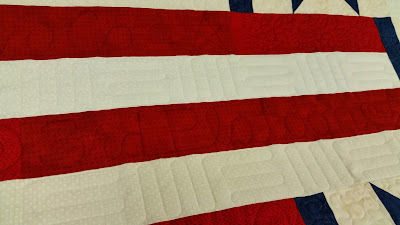 Are You Row by Row Hopping this Year? 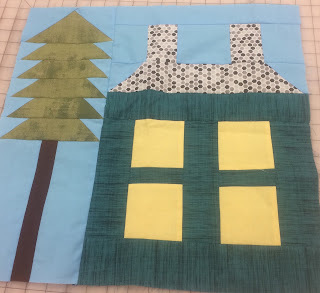 We have the free pattern available in the shop, kits with the pattern and all the fabrics to make it, and packs of pre-fused Die cut shapes for the houses. But you have to come to the shop to get them ~ Row by Row Rules! Again we have kits, or the Free pattern available, and loose License Plates. 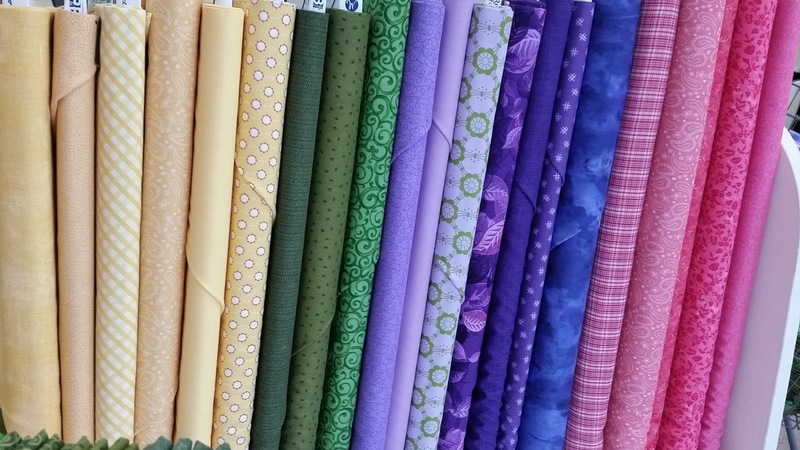 Only one Free pattern per person/per shop though so you have to choose which one you want for your Freebie ~ but can buy a kit that includes the pattern if you want both of our Rows...or buy a kit for each! 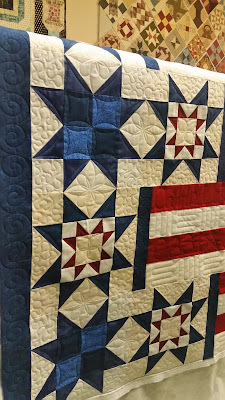 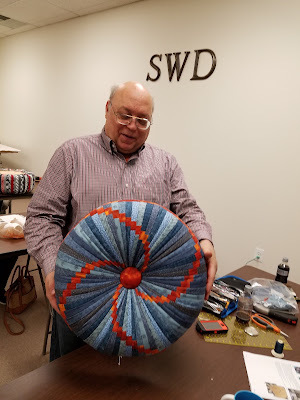 Part of our mission at Spring Water Designs Quilting, along with introducing the art of quilting to the next generation, is to support and promote our Local Quilt Guilds and highlight all the good work that you all do. With that in mind we will be featuring a Local Guild each month this year in our Newsletter and on our Blog. 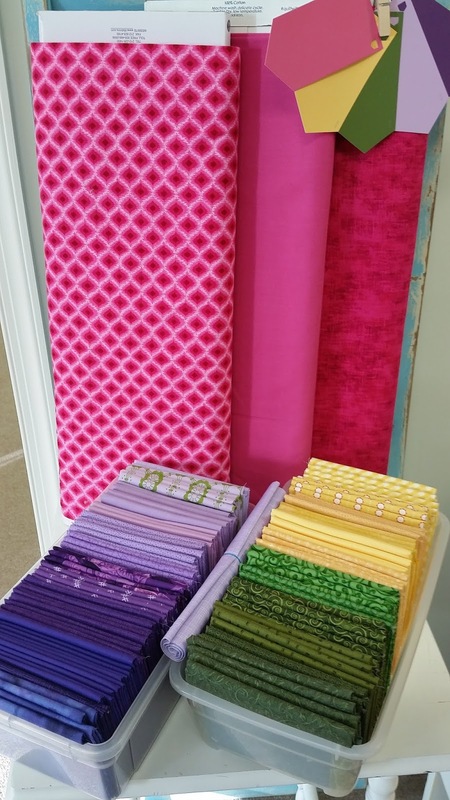 We are so appreciative of all the support we’ve received from the guilds in our area since we’ve opened our doors in our Brick & Mortar shop, that we’d like to give back and have a special Appreciation Month for each of our Local Guilds - For the month of June we are featuring Milltown Quilters! 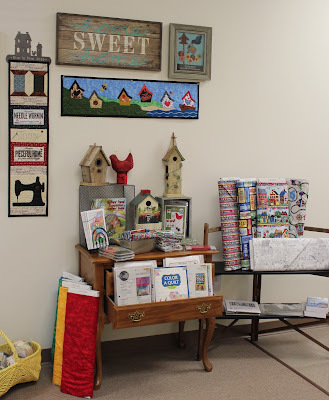 So…during June, any member who comes in any day during the month and shows their current membership card to Milltown Guild will received 15% off regularly priced items they purchase! 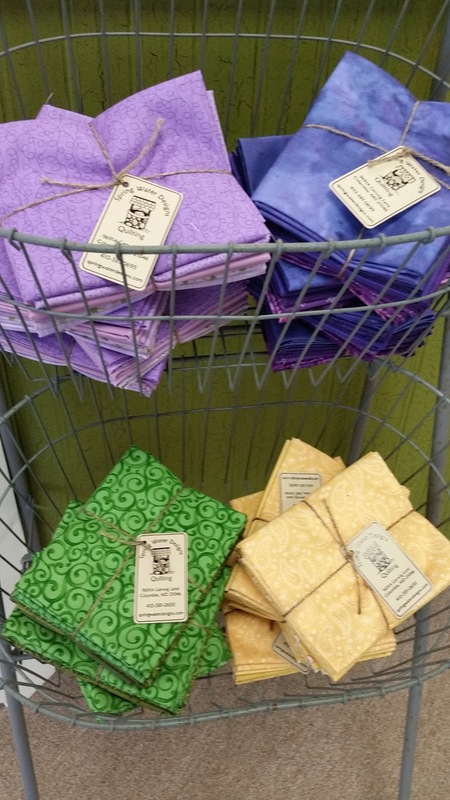 Remember, Every Monday is always our Guild Appreciation Day at our shop, and members of Any Guild receive 10% off of regularly priced items. 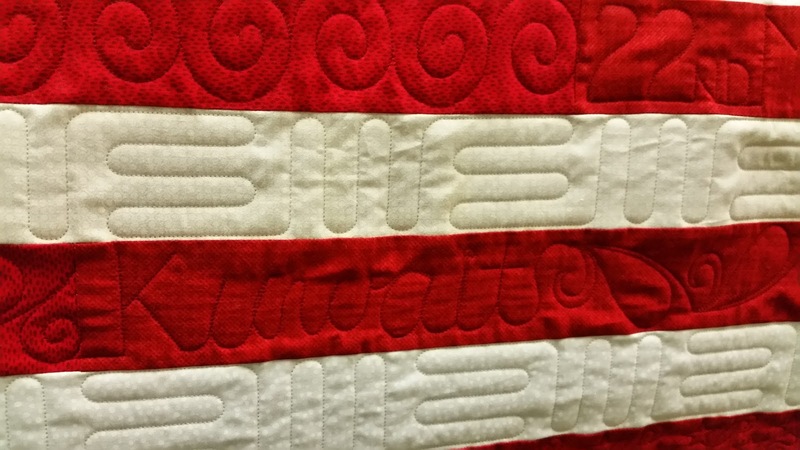 (Just let us know on a Monday that you are a member of a quilt guild). 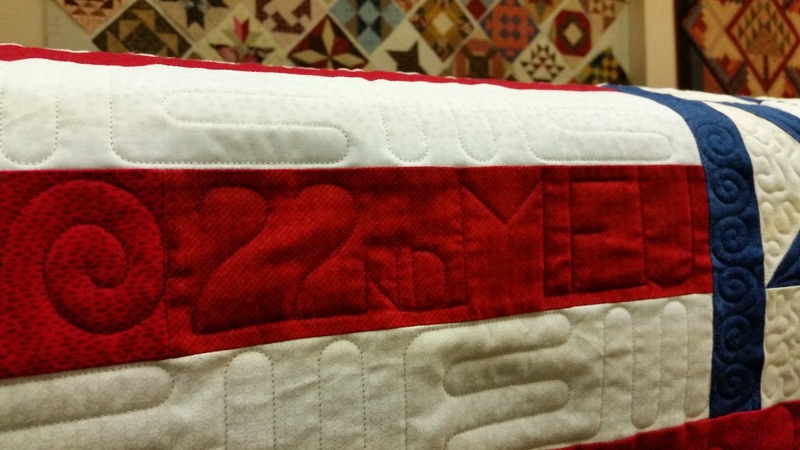 Milltown Quilters Celebrates 19 Years in 2016! 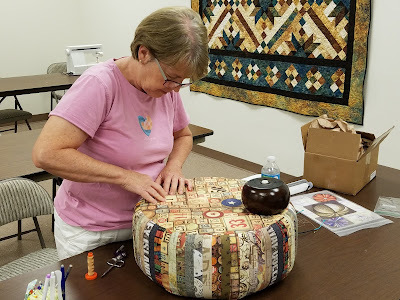 Milltown Quilters became a member of the National Quilting Association, Inc. (NQA) in 1983 and was chartered as Chapter 214. Initially, Milltown Quilters met at St. Paul’s Roman Catholic Church in Ellicott City. In March, 1997, a group of women, including some of the original members, founded Milltown Quilters as it exists today. 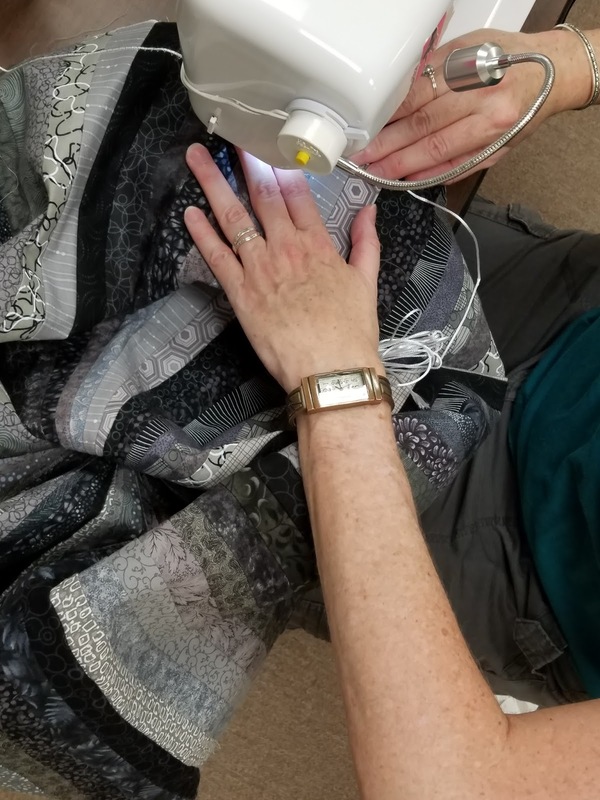 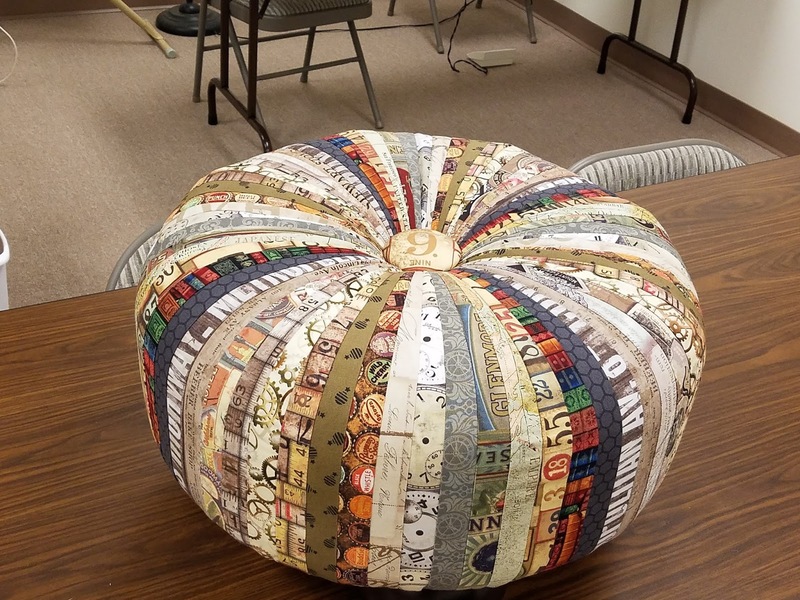 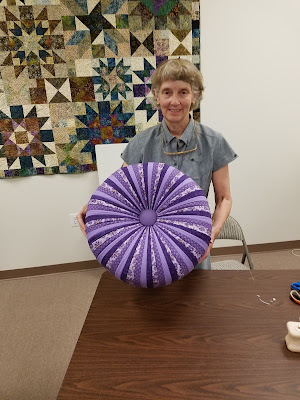 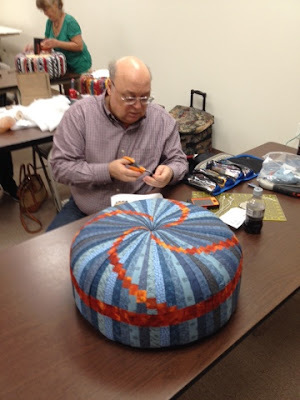 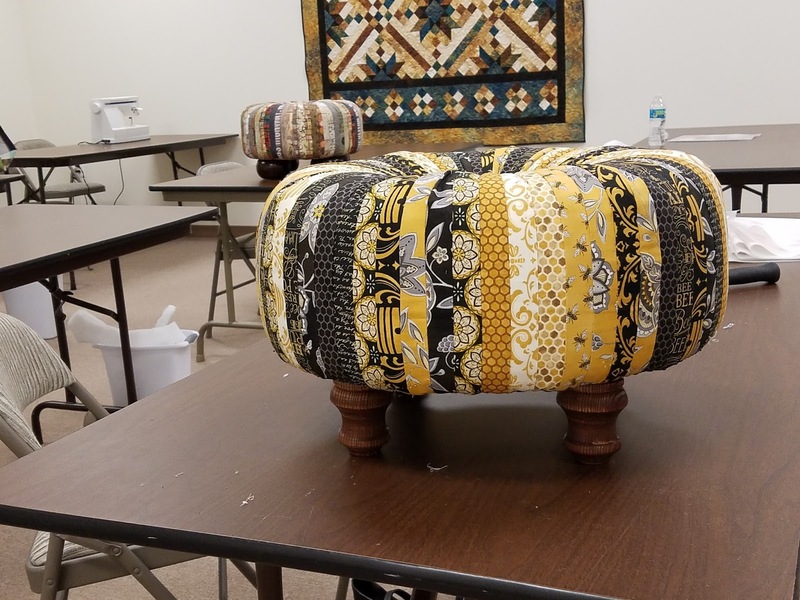 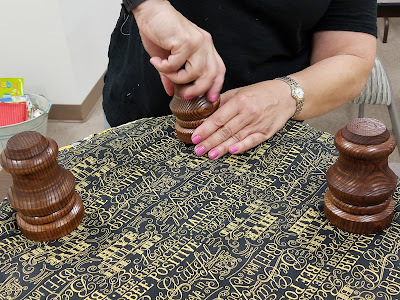 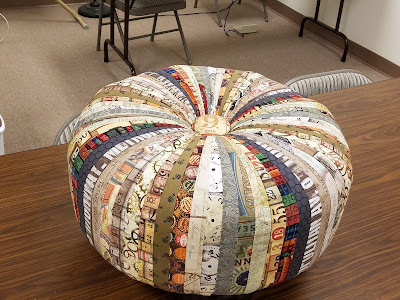 The mission of Milltown Quilters is to provide fellowship and inspiration; to share the appreciation, enjoyment, and knowledge of quilting with members and the community; and to support the community through charitable efforts. 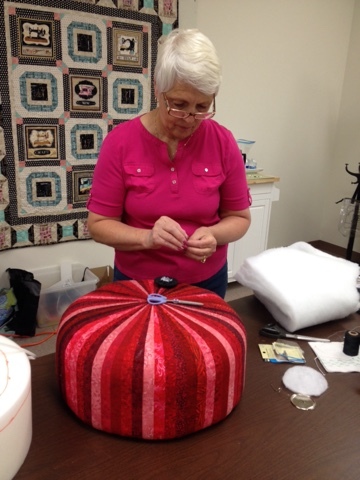 The members of Milltown are invited to participate in all activities. 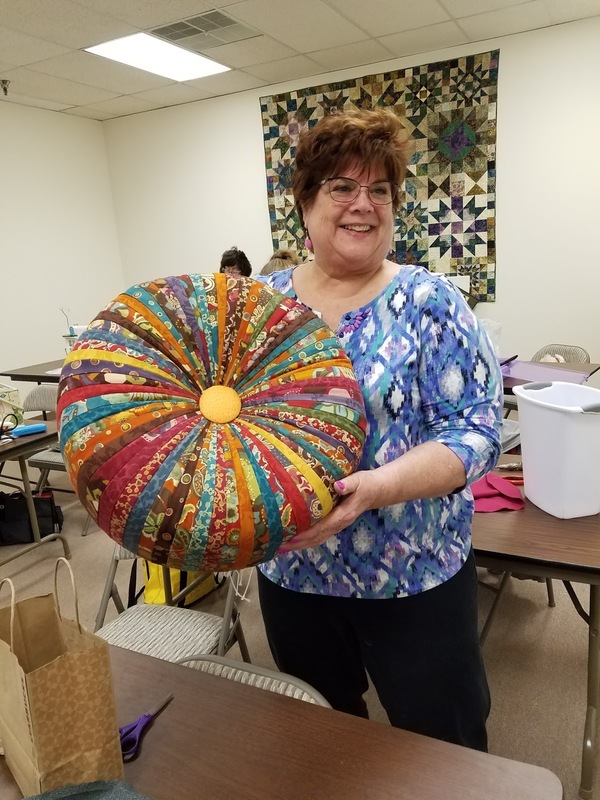 In addition to educational workshops and lectures, by both nationally recognized teachers and their own talented members, Milltown sponsors bus trips to local quilting events, an annual quilt retreat, and two luncheons each year. 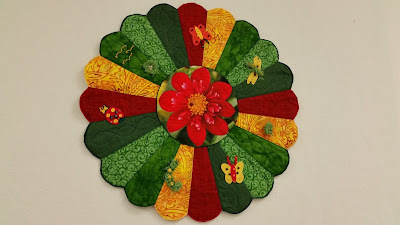 Milltown publishes a monthly newsletter, Milltown News, which highlights their many activities and provides updated information to members, and they maintain a website which contains relevant information: www.milltownquilters.com. Milltown supports the community by sponsoring a yearly Silent Auction to financially assist the outreach efforts of First Presbyterian Church during the holiday season. 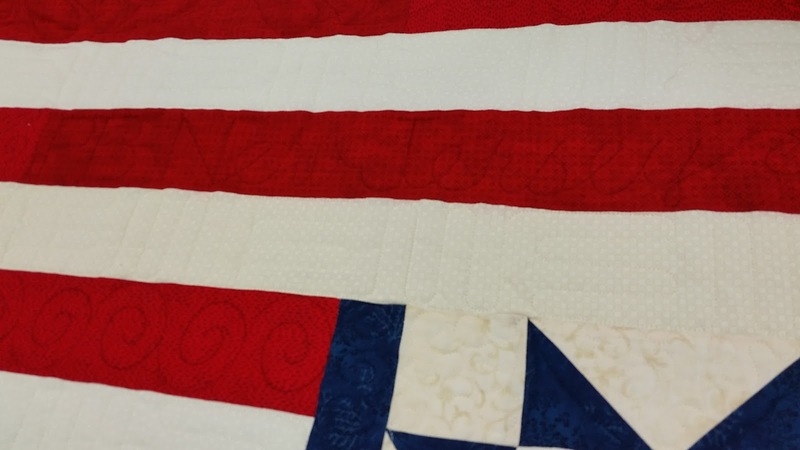 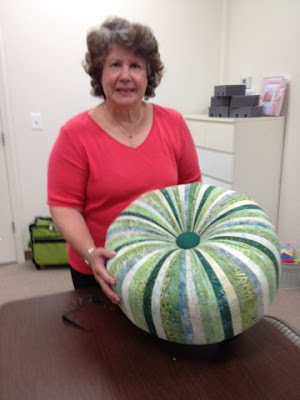 The Friendship Quilts Committee organizes the construction of quilts and other items to be donated to various charitable organizations within Howard County and neighboring counties. 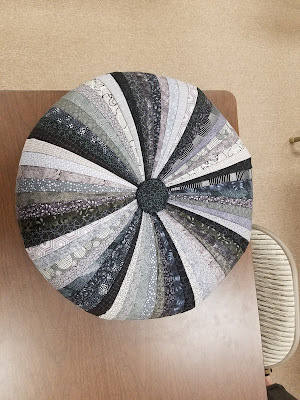 At the biannual Quilt Show, a Raffle Quilt is featured designed and made entirely by members to help raise funds to ensure the continuation of all our activities. Milltown Quilters meets weekly on Mondays from 10:00 AM to 2:00 PM at the First Presbyterian Church, located at 9325 Presbyterian Circle, Columbia, MD 21045, near the corner of Route 108 and Route 29. 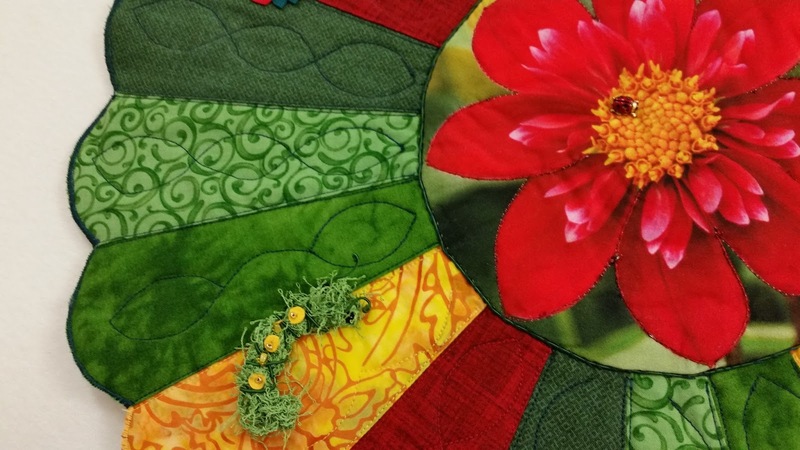 Bring a lunch and spend Monday mornings quilting while making new friends. 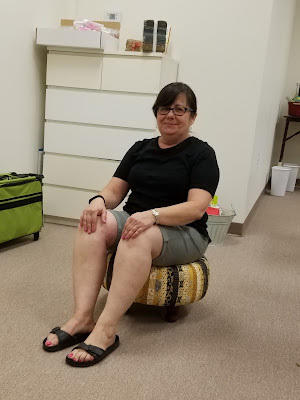 During the summer months (June, July, and August) members meet informally. 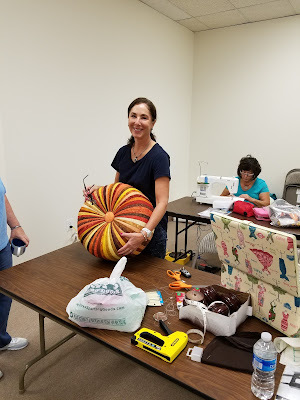 The first official meeting will be on August 29th, 2016 and many special events are already on the calendar - Friendship Quilts work days, a bus trip to the Hershey Quilt Show on July 22, a lecture and workshop by Gyleen Fitzgerald on August 19th, "Boo Bingo" in October, a Quilt Retreat scheduled on November 1, 2, and 3, and so much more. Contact Milltown Quilters for more information if you want to join in on the fun! 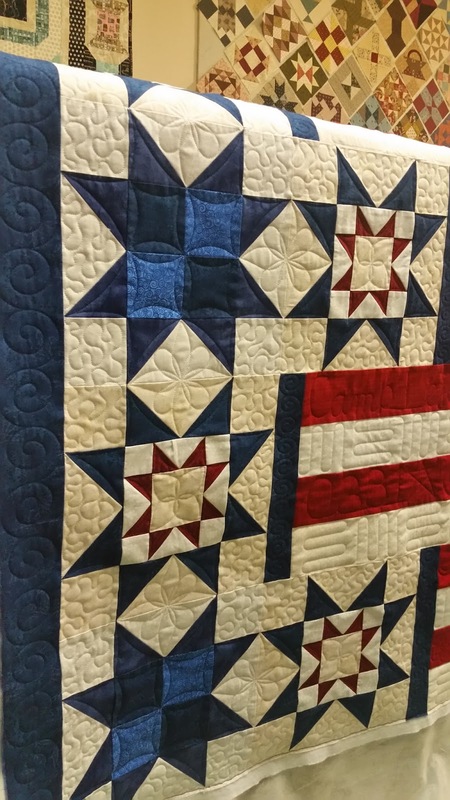 Thank you again to our Local Guilds for all you do in promoting and keeping alive the art of quilting that means so much to so many! 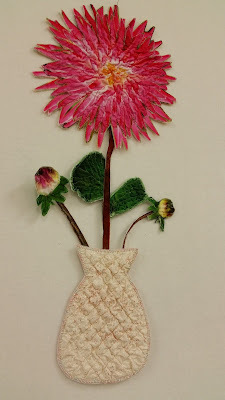 Our Dahlia Panel Challenge Winners! 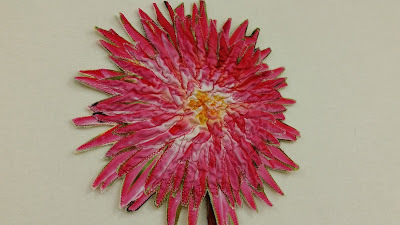 Three amazing entries came back into the shop from our Dahlia Panel Challenge, but they were all lovely and brightened up our shop as they hung in our classroom this month for all to vote on :) This entry was from Margaret Pipp! This one was made by Barbara Lanore. 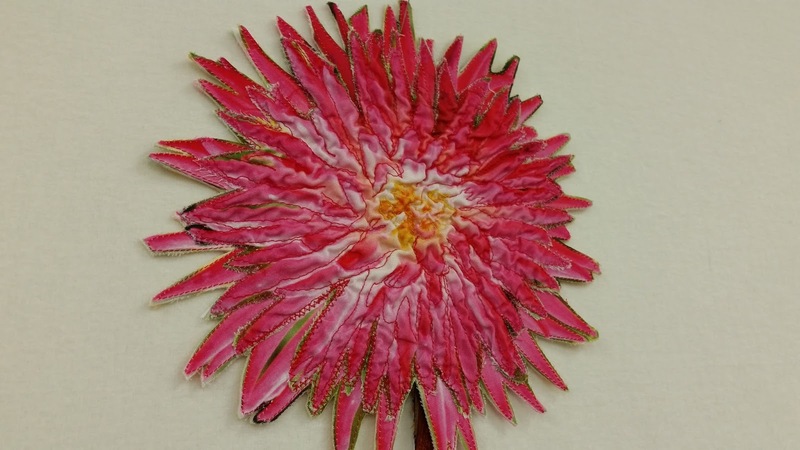 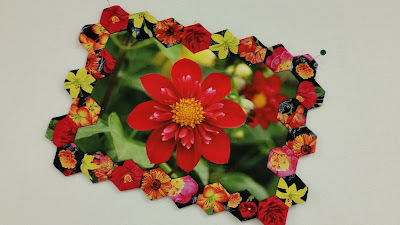 She used English Paper pieced hexis to border her large dahlia photo.